Do you need someone to cheer you on? How are things going with you this week? We changed our clocks last weekend and it's only an hour forward but at the same time it makes all the difference. Our cats still want breakfast at the same "tummy time" ... oh well, they'll adjust! This week I received a terrific question from a student who was doing my So You Want to Start a Pilates Business online program. I thought everyone might benefit from my response because everyone has clients, customers and/or patients to follow up. Hello Ingrid, I'm working through your online program and I need your help please. Is there any template or any formula I can apply to my studio as a follow-up process for new and regular clients? I have noticed that sometimes when I am not physically present in the studio it is hard to have a track of all the clients and I tend to forget to speak to someone or to ask about their progress etc. Because I haven’t automated a system for that, I guess my clients could feel really lonely sometimes. Do you have any suggestions to address this problem? This is such a terrific question and one of my favourite topics. I get asked this exact question or some version of it at least once a week if not more often. Book time into your calendar to follow up with clients and do it – just call them. The truth is that when we don’t have an automated system to follow, things don’t get done. The trick is to set up a system. Follow up is something that pretty much every business can implement. * Who do you want to follow up? * Why do you want to follow up with your client? * What do you want your client to do as a result of your following up? I work with many different health professionals and client based businesses so let me give you a few examples of the ways I have worked with my clients to help them to follow up with their clients, patients and customers. You may find some of these ideas inspire you for how to follow up with your new and regular clients. Recently I’ve been working with a physiotherapist and they’ve instigated a system where every single new patient receives a phone call on the day following their first treatment. Every single client receives this call the day after their first treatment. They also have other follow up calls during the first weeks of treatment. I’m working with a yoga client in the US and she runs a mix of small group sessions and larger unlimited classes. When a new client books a session she and any other instructor makes a point of speaking to that person when they first come into the room, they help them find a spot and introduce them to another regular member of the class. They ask the new client to please stay for a few minutes after the class is finished. At the end of the class they check in to see how they went – and of course they were aware of their progress during the class. One of the key messages they say is “It is super important for you to come back tomorrow, is there any reason you cannot come? Can you come the next day?” and together they book them with the booking app into their next session. Here is one more example of an effective follow up system. One of my dental clients wanted to follow up with her patients. Originally she wanted to call all of them and then wondered if that might be a bit weird. So alternatively she opted to call all the patients she saw on any day who had a big treatment – for example a large filling or an extraction. We mapped out how it would work. At the time of the treatment she lets them know she’ll be checking in with them the next day and asks what is the best way to call them, the best number to reach them on. Every day she sets aside time in the morning to make these calls and ... she ... calls ... them. Another member of the team is responsible for calling the new patients and a different team member calls all the regular patients after their treatment. Everyone gets a call! Together we developed the wording for each scenario, we worked together to practice and “role play” so that it feels normal and comfortable. The team love it and their patients love them for calling! Claudia as you can see there is no one right way to do this. Based on your studio, your client mix, the types of sessions you offer - your system for follow up will be different to everyone else reading my response to your question. As I said, this is a topic I believe is a game changer when it comes to staying connected with your clients. If follow up is done properly - caring and well intentioned - it is NOT annoying. Claudia, you care about your clients, you care about them taking care of themselves and you know that when they keep coming back it makes all the difference in their lives. They don’t want to feel lonely, or invisible. No-one does. In the world today where everything is technology and automation, it doesn’t take much to make people feel special by giving them the personal touch. This is why you do what you do …. Please let me know how it goes! Have you implemented a follow up system in your business? I'd love to hear what's working for you. I truly believe that how we follow-up makes an enormous difference to how clients, customers and patients feel about our businesses. There has never been a better time to start a business; to be in business. Focusing on making business simple enough for everyone to understand. Is it time for you to book your conversation with me ? We all need a sounding board from time to time. And when we are focused in our business it can be easy to feel isolated and disconnected from people around us. It's always great to know there is someone who will help you bring clarity and confidence to those difficult and challenging hurdles. Someone who will cheer you on when you need it most! That's me, this is what I do for my clients. If you feel it is time for you to have a dose of Ingrid's knowledge, wisdom and energy ... then click here to book a time that works for you. Think about it: In 15 months we will be "cheering" in 2020. Yep in just 15 months, and you know how fast that will fly by. Where do you want to be? What would you like to be doing? How can I help you? Over the next 4 days you can book to to have a conversation with me about your business dreams and goals. The sessions are 20 minutes and they are my gift to you as we all prepare for the next decade! Book your session click here and you can choose a time that works best for you. 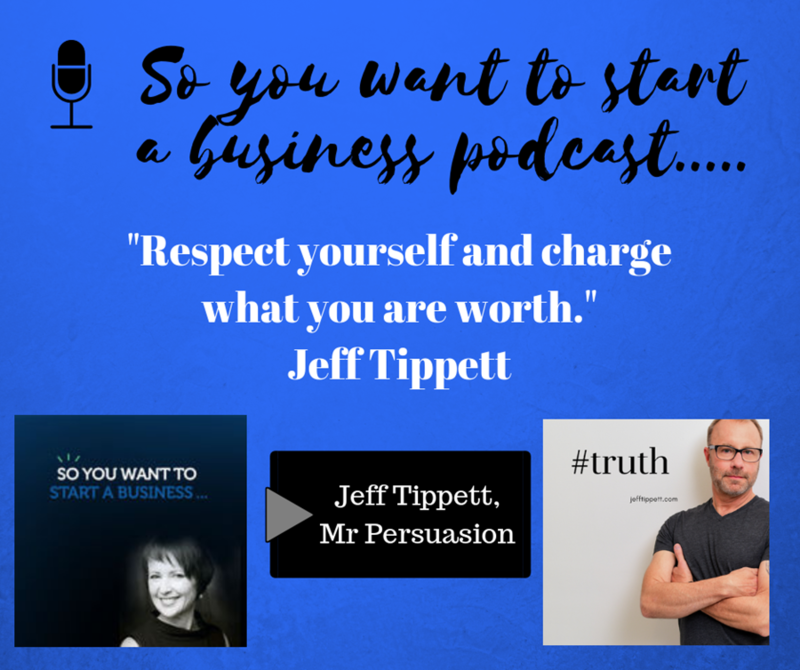 Known by audiences and fans as Mr. Persuasion, Jeff Tippett is a subject matter expert in persuasive communications and his business story is also pretty persuasive! He shares some really commonsense words of advice including, "never make enemies because you never know if one day they may be writing your paycheck." TOO TRUE. Need to catch up, no problem. Binge episodes here on iTunes, or head to my blog to read the transcript. ☑️ Grab a free excerpt of my book This is the first 20 pages and will get you started on what it takes to create, start and grow your own business. Click here to read your first 20 pages. ☑️ Buy a copy of the whole book. "So You Want to Start a Business; the 7 steps to create, start and grow your own business." Available now from Amazon click here or if you are in Australia click here for Booktopia. ☑️ Join the membership only Training Resources Library. This is an online library of all our exclusive material that isn't on the website. There are recordings of webinars, templates and other bonus content not available anywhere else on the website. Click here to find out more ... and to join. ☑️ Work one to one with me. Every month I keep session times for people like you who need one-on-one time with me. We know there is a tonne of resources on the website, in this newsletter, in the podcasts, in the Membership Library and yet ... we also know that there is tremendous value in having dedicated time for just you and your particular business questions, goals and dreams. Click reply and let me know your biggest question today, your greatest challenge right now and we can get started working together. Focusing on making business simple to understand for everyone.